We had a big dinner with both Alexis and Giao's families at Bong Su, a high-end Vietnamese place near our house. The food was really delicious and with so many people, we ordered quite a few things, not all of which are shown below, since we didn't eat them. Including alcohol, tax and tip, this meal came to about $50 per person, which was really quite a good deal considering everyone left stuffed and happy. 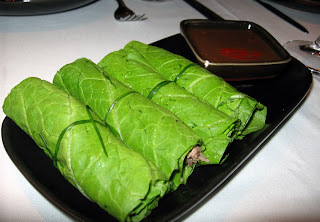 Succulent pieces of duck wrapped in tender mustard greens. 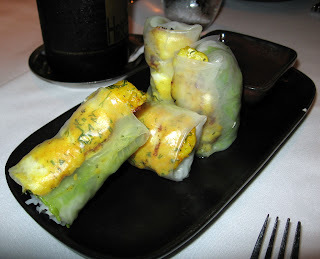 This is an innovative and delicious way to start the meal. An order of this actually comes with 5 pieces, but people dug into this before we had a chance to take a picture. 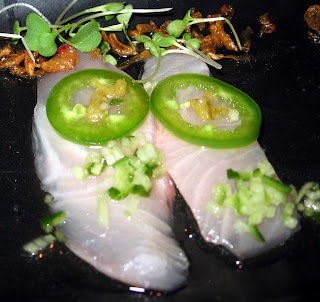 The fresh, thinly sliced fish is dressed in a lime based sauce and served with a single slice of jalapeno. 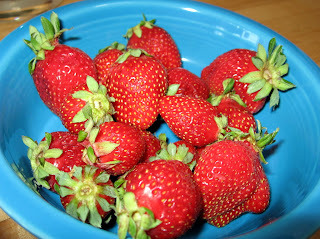 Fresh and very tasty. Even Alexis' mom, who generally is not a fan of raw fish loved this dish. Tumeric grilled catfish and fresh herbs make this light roll very satisfying. The tender beef and the crunchy cabbage and apple are great texture contrasts. 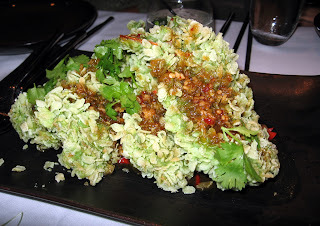 The lime and fish sauce base dressing brightens the dish. The beef was melt-in-your-mouth tender, as it should be. 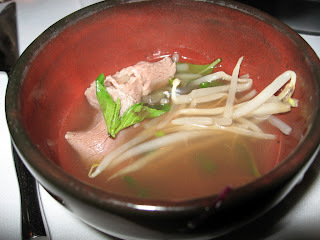 The broth was nothing special. These huge butterflied tiger prawns were coated in what seemed to be green rice crispies and topped with a chili mushroom sauce. These were not our favorite dish, but we were amazed the that crust adhered to the prawns so well and was not at all greasy. 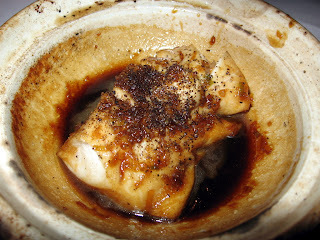 This carmelized black cod is so delcious. The fish was cooked perfectly and the sauce was finger-licking good. 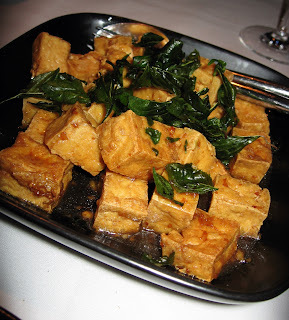 This filling dish of deep fried tofu in a slightly sweet chili sauce is topped with deep fried basil leaves. Price-wise, this dish is a steal. I think it could turn even the most staunch tofu hater into a tofu lover. 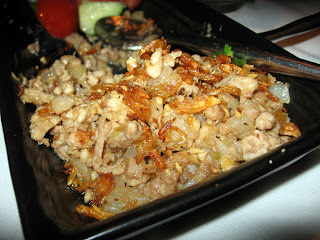 This is tasty dish of ground pork cooked with lemongrass, garlic and shrimp paste. Although shrimp paste is usually overpowering, in this dish it was quite good. We were both really impressed with this tasty little bite. The crust was tender and flaky and the tartness of the goat cheese and tomatoes really cut through the butteriness. 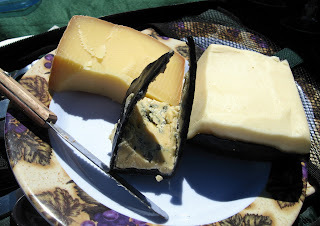 We usually use this quince paste with manchego cheese, but fontina was good too. Salty bites to cut the tannins in the wines. We were up in Napa wine tasting and we didn't want a long, drawn out lunch, so we decided to go to Taylor's. While we'd been to the San Francisco outpost of this burger joint too many times to count, we'd never been to the original. The food was just as good (and expensive) as the San Francisco location, but the menu had fewer items. Taylor's is the perfect place for a low-key burger and glass of great wine. 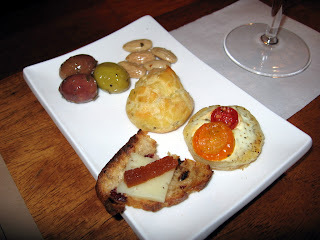 The quaint atmosphere of the St. Helena location was really great. It was a beautiful day and we took advantage of the plentiful, shaded picnic tables on a grassy lawn while eating our greasily delicious food. 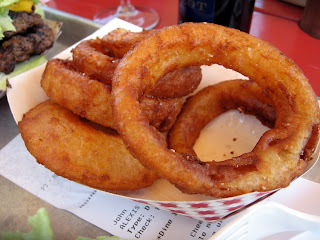 These super-crunchy, onion rings have a light, slightly tangy batter. Usually Alexis tries to abstain, but this time, she just couldn't. Eh, not really the greatest. 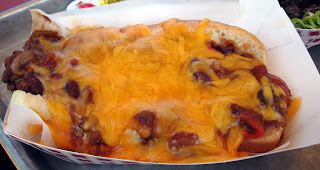 The chili is too bean-y and the hot dog is not of superior quality. This tasty, juicy burger is served with "special sauce" onion, tomato and pickles. 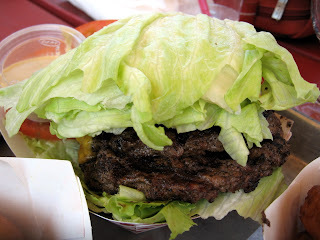 And we always get it wrapped in lettuce instead of a bun. 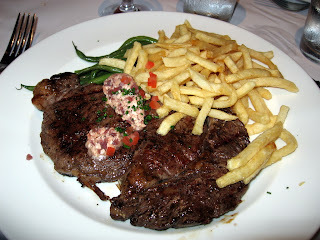 For the second time this week, we ate at House of Prime Rib. This time it was a dinner with Giao's family. A prime rib dinner, including salad, bread, yorkshire pudding, cornbread, creamed spinach or creamed corn, baked or mashed potato, PLUS seconds comes to about $33. 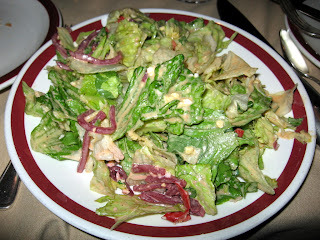 A tasty salad with a creamy dressing and the odd addition of pickled beets. 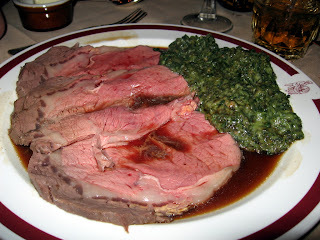 Tonight the prime rib was incredibly tender. Very, very good. 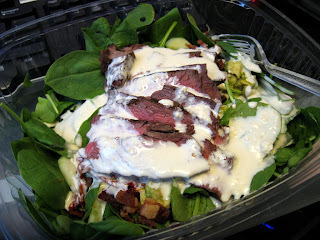 This one had baby spinach, bacon, cucumber, sun-dried tomatoes, avocado, and grilled filet mignon in a blue cheese dressing. 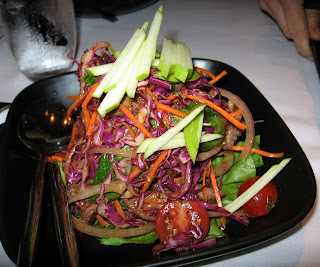 These salads are delicious and made with fresh organic ingredients. They are also expensive, so Alexis only gets it when it's being catered in at work and she doesn't have to pay. 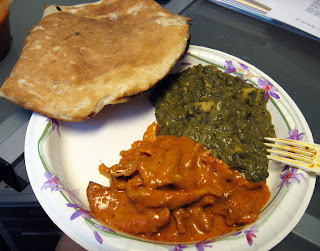 A spicy, yet delicious breakfast of leftovers from Mehfil Indian. 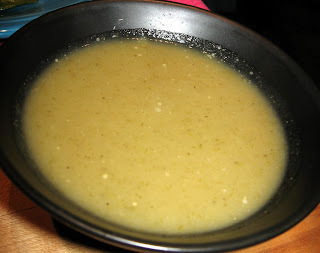 A tasty, smooth, creamy soup without the use of starches or cream. Sautee onions in a bit of olive oil until soft. Add turnips, garlic and fennel and sautee a few more minutes. Add chicken stock and pepper and bring to a boil. Reduce heat and simmer, covered, until veggies are fork tender, about 20 minutes. 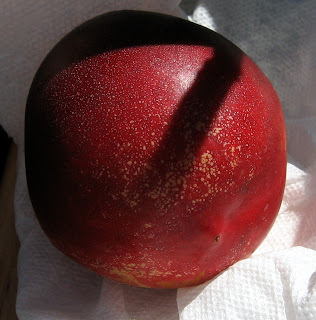 Puree with an immersion blender (or a regular blender or food processor). Strain though a fine seive and serve. Several varieties of heirloom tomatoes give this salad beautiful color and flavor. 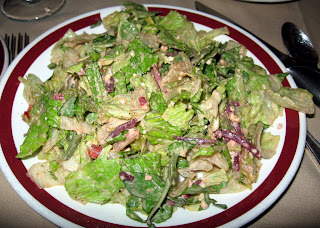 The salad is dressed in a simple balsamic vinaigrette of one part each oil, balsamic vinegar and grainy mustard. We don't usually make such carb heavy food, but we had company. 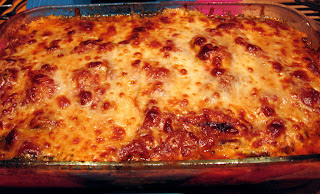 Alexis made one large batch of sauce and used it for this dish as well as for the lasagna below. 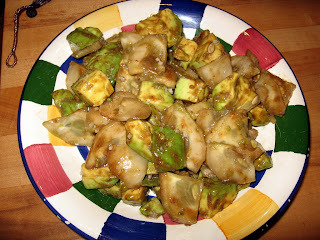 To the sauce, she added sliced zuchinni. 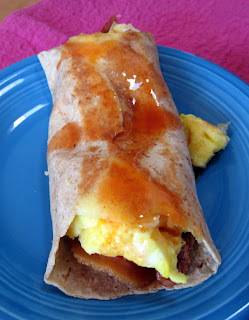 Mix all of the ingredients thoroughly with your hands and roll into balls with about 1" diameter. In a large sautee pan heat about 3 tb of cooking oil (not olive oil). Add all of the meatballs and pan-fry until done in the center and crispy on the outsides. Shake the pan often to turn the meatballs. Add the meatballs and some thinly sliced zuchinni to the tomato sauce (recipe below) and then simmer for about 10 minutes. 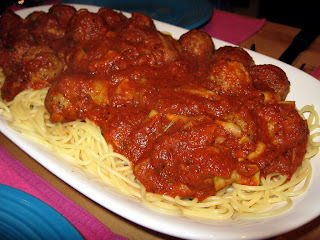 Ladle meatballs and sauce over al dente spaghetti. We love this dish because even though the "noodles" are made from zuchinni, you really don't feel like you are eating a "mock" lasagna, but a real one. 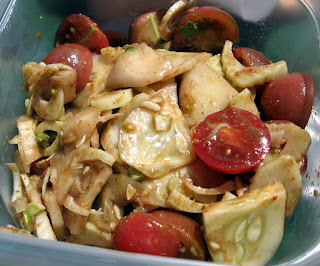 Click here for a video demo of how to make zucchini "noodles". Sautee onions and ground meat until browned and done. 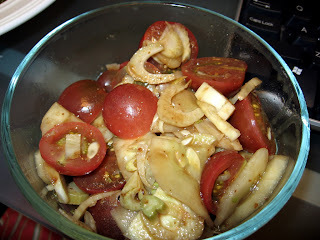 Sautee the onions and garlic in a bit of olive oil until beginning to brown. Add all of the other ingredients. Stir and bring to a boil. Reduce heat and simmer, covered for about 25 minutes. Remove bay leaves and puree the sauce. Season with salt and pepper. Preheat the oven to 375. Grease a 9x13 glass baking dish and layer the bottom with zuchinni noodles, slightly overlapping. Season with salt and pepper. Ladle about 1/2 cup sauce and spread over the zucchini. Layer half the meat and 1/3 of the cheeses. Add another layer or zucchini noodles. Season with salt and pepper. Spread the ricotta mixture evenly over the zuchinni noodles. Sprinkle all of the olive evenly over the ricotta mixture. Add another layer of zuchinni noodles and season with salt and pepper. Ladle about 1/2 cup sauce and spread over the zucchini. Layer the rest of the meat and 1/3 of the cheeses. Add a final layer of zuchinni noodles, season with salt and pepper and ladle about 1 cup of sauce over the zuchinni, spread evenly. Add the rest of the cheeses. Poke a few toothpicks in the top of the lasagna to prevent the foil from sticking to the top layer of cheese. Cover with foil and bake on 375 for about an hour. Remove the foil and bake for about 5 more minutes, until the cheese is golden and bubbly. Remove from oven and let sit for about 10 minutes before serving. 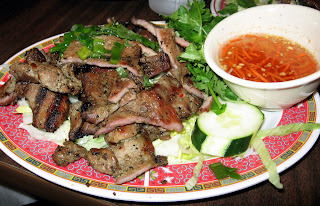 This is Alexis' favorite dish at Tu Lan. Tender, slightly charred pork this a sweet-salty-sour dipping sauce. 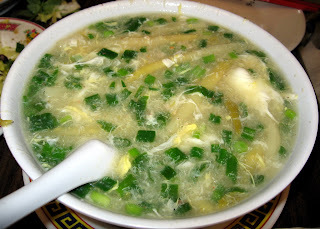 Crab and white asparagus with egg and scallions in a slightly thick broth. We never go to Tu Lan without ordering this. 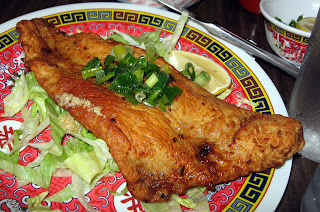 This dish used to be a whole fried fish, but now it's a breaded, fried filet of fish and it's just not as good. 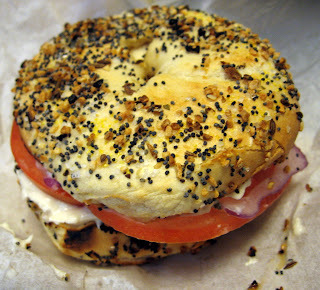 After dropping Giao's dad over at an early morning conference, we headed to the only bagel place we know of that still has low-carb bagels on offer. 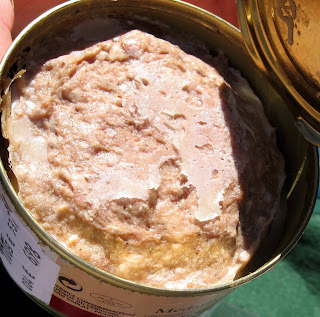 Not enough spread, but still tasty. Always tasty. The mahkni was particularly good today. 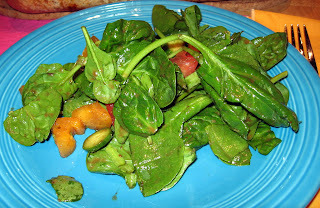 Dressed with balsamic vinegar and seasoned with salt, this was a tasty, lettuce-free salad. Alexis likes to experiment with different ingredients in curries. Today she added roasted squash in an effort to thicken the sauce. It worked well and tasted great. Roast the squash in a covered baking dish (or cookie sheet covered with foil) on 400 until soft--about 45 minutes. Boil the shirataki noodles for a minute, drain and set aside. Scoop flesh and set aside. Sautee the onion in a bit of olive oil until beginning to soften. Add the coconut milk, water, curry paste, lemongrass, fish sauce and shirataki noodles. Simmer for a few minutes. Roughly chop the squash flesh and add to the pan. Simmer for several minutes. 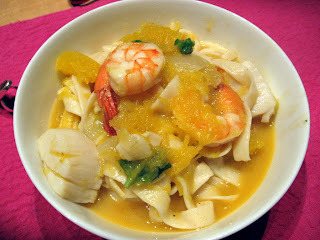 Add the shrimp and scallops, cover and simmer for a few minutes, until seafood is just done. Remove lemongrass pieces. Season with salt, lime juice and basil and serve. 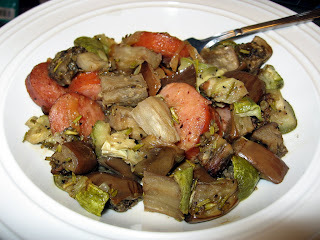 The keilbasa fared well in the re-heating, but the veggies were a bit mushy. These veggies all hold up well to a day or so of refrigeration with little softening. 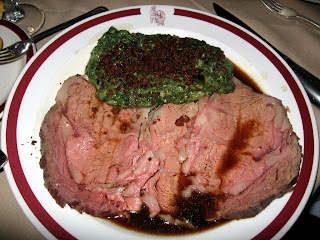 After Giao's fantasy football draft we headed to House of Prime Rib, a San Francisco institution, for a hearty dinner. It was very tasty, as always. A prime rib dinner, including salad, bread, yorkshire pudding, cornbread, creamed spinach or creamed corn, baked or mashed potato, PLUS seconds comes to about $33. Iceberg lettuce, beets and cheese dressed in the house dressing, which seemed to be some sort of thousand island. We always ask them to go light on the dressing, which is a smart idea, because even when they go light, there is still quite a bit of dressing. Very tasty. 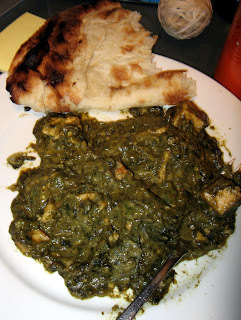 Tender meat and tasty spinach. We always ask for extra bacon bits to sprinkle on our creamed spinach so it can be even more artery-clogging...I mean...delicious. We decided to celebrate labor day with a lazy picnic in the park. A tasty salad of summer veggies, dressed in a simple balsamic vinaigrette. 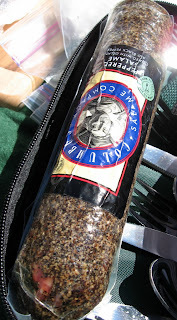 We ate the last of our pates procured on our trip to Germany in June. Mmm. It was so good. We met Giao's sister and brother-in-law for dinner at our favorite French bistro in the city. This place never disappoints and though the menu doesn't change often, there's really no need for change. The standards are delicious. 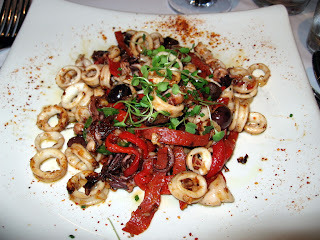 This dish is a great deviation from the ubiquitous fried calamari dishes. Sauteed with roasted red peppers, jalapeno and chorizo, this dish is light and spicy and packed with flavor. 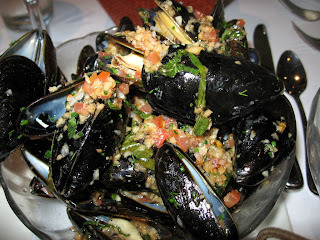 This heaping bowl of mussels was served in a sauce of garlic, herbs and sherry vinegar. The steak is huge and tender. 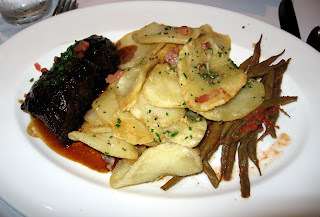 The red wine butter is flavorful and succulent and the pommes frites are crisoy and cut from real potatoes. We always ask for a side of their homemade (and utterly delicious) mayonnaise. This was the special of the day and while the steak was tasty, the thick cut, deep fried potato chips were the stars of the show. They were crispy on the outside and a bit chewy on the inside and they were smothered with garlic and herbs.